One of the best poets alive today — or in my opinion, the best poet alive today — is coming to St. Paul this month. Gary Snyder, hero to my heroes, profound poet, wanderer of the wild, mounter of mountains, meditator, dharma bum, will participate in Minnesota Public Radio’s Talking Volumes series. Which means he’ll sit on stage at the Fitzgerald Theater (home to A Prairie Home Companion) and talk about the wild, ecology and, of course, poetry, with Kerri Miller. I got our tickets this morning, so I’m now okay advertising this sure-to-be wonderful evening. We were blessed with a reading by Snyder at City Lights Books on our honeymoon to San Francisco, and that was an experience of unparalleled joy… Yet, that was just a reading with some questions and answers (which, standing in another room with 100+ sweaty bodies packed in between me and him, I could only sometimes hear). This event promises to be a real chance to hear his thoughts on all the things that fascinate me about him. Snyder is a frequent character in my ramblings on this blog. 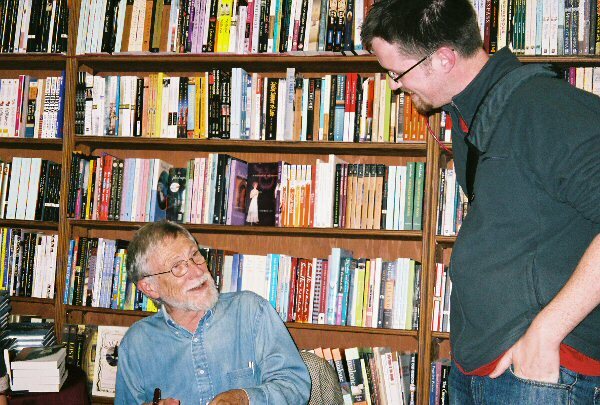 Heck, here’s me exchanging a couple pleasantries with the good man at City Lights. Anyway, just had to ramble on about this a little bit. Cheers. This entry was posted in life and tagged words, writing on Monday, April 04, 2005 by Greg. This entry was posted in life and tagged life, words on Wednesday, March 16, 2005 by Greg. The birds were singing as they were known to do at that time of the morning. The birds were singing as they were known to do at that time of the morning. The late season meant that they would do this for an ever-decreasing span of time until finally the chill of the morning merged with the chill of dusk and they would not sing at all for weeks and months. When we unpiled from the van in the birds were singing though. A quick yell from Neal and they were temporarily silenced. The crack of a beer can and Neal was temporarily silenced. Most of the other people smart enough to be in the woods this time of year were hunters of birds and deer. And the six of us. Me Neal Honey Lily Charlie Ernie Lucy Alice. And Bill, yellow lab. All writhing and reacting in a solid mass of us. The long ride out to the land had been drunken and hungover. Coffee beer and tea. The sky was blue and silver this day, though we would find that in the low spots some ragged gray remnants of the damp dawn remained. Standing in the almost empty parking lot I lit a pipe of an exotic sort and rallied the legion. Friends, I declared, let’s set off. With a ceremonial intoxicating puff on my pipe for each, we did so. There was dissent and disagreement from the outset, regarding the destination, the path to be followed, the speed of travel, the rationing of supplies, leadership and followership, and sundry other topics. The arguments were engaged with spirit and culminated in nothing of consequence. As I had been the person most recently at the literal wheel, all the troop soon deferred to my decisions and fell in. With a high glacial ridge to our left, a vast marsh to our right, and the trail rolling around subtle curves, we strode and stomped and stumbled. Some surged ahead while others fell behind. Those ahead were driven by further curiosities and conclusions they knew were ahead, while those others were distracted by objects of investigation to the side of the trail and beneath their feet. I walked mostly with Neal and Honey at first. Neal held court on some personal ambitions, ardently seeking our advice, reactions, shock, envy and support. Honey eventually took the reins and piloted us on a journey of her own. Ah but there you see, Honey, there is what I’m talking about, Neal interrupted the lady. No, no, I agree with you is what I’m saying. I agree with you. I think what you’re talking about is part of what I’m talking about or what I’m talking about is part of what you’re talking about but either way what I’m saying is: everything that’s wrong right now is because we’re always doing the easy thing. Well that’s not what I’m saying. Yes it is! It’s this whole problem of the path of least resistance. Most people are going to walk downhill and not evenâ€”this is the sad partâ€”because they pick that trail but because that’s just the way they walk. But I’m talking about Jason and Julie here. Well yeah, I think you’re saying neither of them even seem to like each other anymore and nobody sees them any more because they don’t enjoy being with each other and being with other people just makes it worse. And what I’m trying to tell you is that it’s all because it’s the easy thing for them to do. It’s easier to stay together than it is to break up. I think that can be true but I don’t know if it is with them. I think it’s the case here. It’s easier to be with someone than alone, isn’t it? It’s better, I don’t know if it’s easier. I’m telling you, it’s easier. This entry was posted in Uncategorized and tagged the woods, words on Monday, February 21, 2005 by Greg. Not So Wild a Dream, by Eric Sevareid. Sevareid was the guy who wrote Canoeing with the Cree about his and a buddy’s 2000 mile canoe trip from St. Paul to Hudson Bay in the 30s. An incredible book. This is supposed to be a great book about America during WWII and the American spirit. Whitewater; Quietwater, by Bob and Jody Palzer. A very factual guide to the rivers of NE Minnesota, Wisconsin and the U.P. A map of every river, brief descriptions of each river. Already tons of ideas for canoe trips this summer. We live in a great paddling area. Fay, by Larry Brown. I don’t know much about this particular book, but I was recently alerted to Brown by the news of his premature death. A bad way to hear about a good writer, but alas. Compared loosely to Cormac McCarthy and William Faulkner, if only because he’s a white southern male with a certain morbidity. The River Why, by James Duncan. A classic of fly-fishing literature, I’d been wanting to read it for a while. Had one of the most interesting sounding cover flap descriptions ever, if only because it was a straightforward plot summary and an introduction to the dominant themes of fishing, searching for meaning, love, family, etc. The Singing Wilderness, by Sigurd F. Olson. I’ve been wanting to read some of SFO’s stuff for a while and this seemed like a good first one. He is definitely the king of writing about wilderness and spirituality, and did it all from a vantage point of his love for the Boundary Waters. My problem with the library is definitely checking out too many books at once. I check out like 2000+ pages of material with three weeks (six if I can renew them) to read it. I would probably do much better if I checked out one or two things at once. On the other hand, it is free and I usually end up finishing one or two things, starting a couple others. If I really like something, I’ll either finish it or remember to buy it/borrow it again. I think I check out so many at once because I don’t trust my memory so I request books as soon as I think to read them and I get a ton. This is the best bunch of books I’ve checked out yet and I think I’m going to be doing a lot of reading to try to finish as much as I can in the next few weeks. You won’t hear me complaining. This entry was posted in Uncategorized and tagged words on Thursday, January 27, 2005 by Greg. On that afternoon, when the rain stopped, Cipriano Algor walked down the street to the main road, unaware that his daughter was watching him from the door of the pottery, but he did not need to say where he was going, nor did she need to ask. Stubborn creature, Marta thought, he should have gone in the van, it could start raining again at any moment. Marta’s concern was only natural, it was what one would expect from a daughter, because the truth is that, no matter how often people in the past may have made statements to the contrary, the heavens never were to be trusted. This time, though, even if the drizzle does slither down again from the uniform grayness covering and encircling the earth, it won’t be one of those drenching rains, the village cemetery is very close, just at the end of one of those streets leading off the main road, and Cipriano Algor, despite being of a certain age, still has the long, rapid stride that younger people use when they’re in a hurry. But be they old or young, let no one ask him to hurry today. Nor would it have been wise of Marta to suggest that he take the van, because we should always visit cemeteries, especially bucolic, rural, village cemeteries on foot, not in accordance with any categorical imperative or with some ruling from above, but out of respect for mere human decency, after all, so many people have gone on walking pilgrimages to worship the shinbone of some saint that it would be inexplicable if we were to choose any other mode of transport to go to a place where we know beforehand that what awaits us is our own memory and perhaps a tear. Cipriano Algor will spend a few minutes beside his wife’s grave, not in order to pray prayers he long ago forgot, nor to ask her to intercede for him up there in the empyrean, always assuming her virtues carried her to such high places, with the one some say can do anything, he will merely protest that what they did to me is simply unjust, Justa, they mocked my work and the work of our daughter, they say there’s no interest any more in earthenware crockery, that no one wants it, and therefore we too are no longer needed, we are a cracked bowl which there is no point in clamping together, you had better luck while you were alive. There are small puddles along the narrow gravel cemetery paths, the grass grows everywhere, and in less than a hundred years’ time, it will be impossible to know who was buried beneath these mounds of mud, and even if people do still know, it’s unlikely it will be of any real interest to them, the dead, as someone has already said, are like broken plates on which it is no longer worth placing one of those equally outmoded iron clamps that were used to hold together what had become broken or separated, or, as in the case in question, and using different words to explain the simile, the iron clamps of memory and regret. Cipriano Algor approached his wife’s grave, she has been under there for three years now, three years during which she has appeared nowhere, not in the house, not in the pottery, not in bed, not beneath the shade of the mulberry tree, nor at the clay pit beneath the scorching sun, she has not sat down again at the table or at the potter’s wheel, nor has she cleared out the ashes fallen from the grate, nor seen the earthenware pots and plates set out to dry, she does not peel the potatoes, knead the clay, or say, That’s the way things are, Cipriano, life only gives you two days, and given the number of people who only get to live for a day and a half, and others even less, we can’t really complain. Cipriano Algor stayed no longer than three minutes, he was intelligent enough to know that the important thing is the road you walked, the journey you made, if you are aware of prolonging your contemplation of the grave it is because you are watching yourself or, worse still, it is because you hope others are watching you. Compared with the instantaneous speed of thought, which heads off in a straight line even when it seems to us to have lost its way, because what we fail to realize is that, as it races off in one direction, it is in fact advancing in all directions at once, anyway, as we were saying, compared with that, the poor word is constantly having to ask permission from one foot to lift the other foot, and even then it is always stumbling, hesitating and dithering over an adjective or a verb that turns up unannounced by its subject, and that must be why Cipriano did not have time to tell his wife everything that was on his mind, apart from that business about it being unjust, Justa, but it may well be that the murmurings we can hear coming from him now, as he walks toward the gate leading out of the cemetery, are precisely what he meant to say. i think that’s about all i’ll have for today. This entry was posted in Uncategorized and tagged words on Wednesday, December 08, 2004 by Greg. my boss scott sent this to me today. from this morning’s writer’s almanac. in his words: it’s a dandy. This entry was posted in Uncategorized and tagged words on Tuesday, December 07, 2004 by Greg.